In this extraordinary debut novel with its deft nod to Dickensian heroes and rogues, Mira Bartók tells the story of Arthur, a shy, fox-like foundling with only one ear and a desperate desire to belong, as he seeks his destiny. Have you been unexpectedly burdened by a recently orphaned or unclaimed creature? Worry not! We have just the solution for you! Welcome to the Home for Wayward and Misbegotten Creatures, an institution run by evil Miss Carbunkle, a cunning villainess who believes her terrified young charges exist only to serve and suffer. Part animal and part human, the groundlings toil in classroom and factory, forbidden to enjoy anything regular children have, most particularly singing and music. For the Wonderling, an innocent-hearted, one-eared, fox-like eleven-year-old with only a number rather than a proper name — a 13 etched on a medallion around his neck — it is the only home he has ever known. But unexpected courage leads him to acquire the loyalty of a young bird groundling named Trinket, who gives the Home’s loneliest inhabitant two incredible gifts: a real name — Arthur, like the good king in the old stories — and a best friend. Using Trinket’s ingenious invention, the pair escape over the wall and embark on an adventure that will take them out into the wider world and ultimately down the path of sweet Arthur’s true destiny. Richly imagined, with shimmering language, steampunk motifs, and gripping, magical plot twists, this high adventure fantasy is the debut novel of award-winning memoirist Mira Bartók and has already been put into development for a major motion picture. Mira Bartók is a writer and artist whose New York Times best-selling memoir, The Memory Palace: A Memoir, won the National Book Critics Circle Award for Autobiography. The Wonderling is her first novel for young readers. She lives in Western Massachusetts. Momentum builds toward a thrilling crescendo and, rarest of all, a wholly satisfying ending that still whets the appetite for a sequel. Bartók's language is full of rich description and effulgent inventories of food and places...Bartók's lovely, detailed illustrations and drawings throughout support the sense of enchantment in this imaginative adventure. Captivating and with great potential as a read-aloud. Written with clear and detailed descriptions, this novel drops readers into a strange, magical, mythical, and mechanical world...Bearing some similarities to Lemony Snicket’s “A Series of Unfortunate Events” with shades of Erin Hunter’s “Warriors” series, Bartók’s title will appeal to readers who appreciate anthropomorphized animal characters, high-stakes adventure, and Dickensian settings. A stellar new contribution to fantasy that should find a place in every middle grade collection. Arthur’s Dickensian steampunk world is richly imagined and gorgeously described...Arthur’s story of friendship, hope, and heroics will delight adventure seekers, and the open-ended conclusion and tantalizing hints of larger doings afoot will bring readers eagerly back for the promised sequel. Younger readers not yet ready to tackle a long novel on their own will still be enthralled by the story in shared reading or readaloud. Bartók's prose is as alluring as the story she weaves. Every song, every food, every object adds texture to the world, layering the known, the unknown and the magical...A gentle, modern-day nod to the children's books of old, The Wonderling is a sweet, uplifting adventure. Bartók doesn’t delve into the origins of groundlings but uses them successfully as a stand-in for other disenfranchised groups, with the groundlings subjected to derision and menial tasks by most of the upper classes. Music plays an important role in the story, both as a means of connection and a force for good...Bartók gives readers a richly imagined fantasy landscape to lose themselves in. This beguiling fiction debut from Bartók (The Memory Palace, 2011) is just the ticket for readers who revel in quest stories, or those with a soft spot for animal fantasies. Bartók carefully constructs her world, gracing it with a classed society, music, and a touch of steampunk. A dreamy Dickensian tale of a fox-like, one-eared “groundling”[…] the book’s imagined worlds, from hovels to mansions, are imbued with the wonder of the title and its innocent hero, no match for the Faginesque creatures he encounters, should resonate especially with gentle, guileless readers. Bartok has delivered what I hope will become a treasured classic in children's literature. 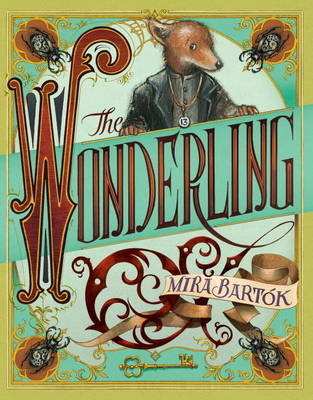 THE WONDERLING is magical, morally-sound and a true treat for readers of all ages...Bartok writes with a lyrical, cadenced voice and her ability to craft a new, magical world knows no bounds. This novel joins riotous exploits with heartfelt wisdom...the most notable element of this story is the pervading message of hope—that no matter how dark the world may seem, there is always light to be found, whether it be in friendship, in the simple sounds of nature or in the countless other small wonders around us. Bartók demonstrates her own inventiveness: one type of device for instance is a combination of passenger pigeon, player piano, and the internet. She also creates memorable scenes. Small sepia-colored illustrations throughout add elegance to this dramatic adventure for children ages 8-13. The richly developed characters and setting immediately enthrall young readers, who might relish this stylishly written story as both a solo and a read-aloud experience. ...a good story that will not be put down until the end is reached. A brilliant, sweeping work of imagination, this grand adventure is filled with marvelously rich characters and unpredictable twists and turns, making this novel one that won't let you down for one second. This richly imagined, enthralling fantasy with its evocative names and lovely writing, is the debut children's novel from Mira Bartok, a writer and artist who who the 2011 National Book Award for her memoir "Memory Palace." Middle graders will enjoy this high-adventure Victorian steampunk animal fantasy with music, clever prose, and quaint illustrations, done in ink, graphite, and gouache.